This screen will display all received purchase orders with the details of pricing, tax, discount and handling charges. If you want to review your overall purchase performance or want to see vendor wise purchase details or you want to review a single purchase order, this will be the best place for you. PO ID : Please enter the PO ID to review the information for any specific PO else keep this field blank. Vendor Name : Please enter the vendor name to see the transaction details for a vendor. For all vendors keep this field blank. Branch Name : If you are a multi branch company, please select the branch name. This field is not applicable for single branch company. Date Range : Please select start date end and end date to review purchases for a time frame. After your selection, please click on SUBMIT. Data will display with following information. Vendor Name : Vendor who sold the material to you. 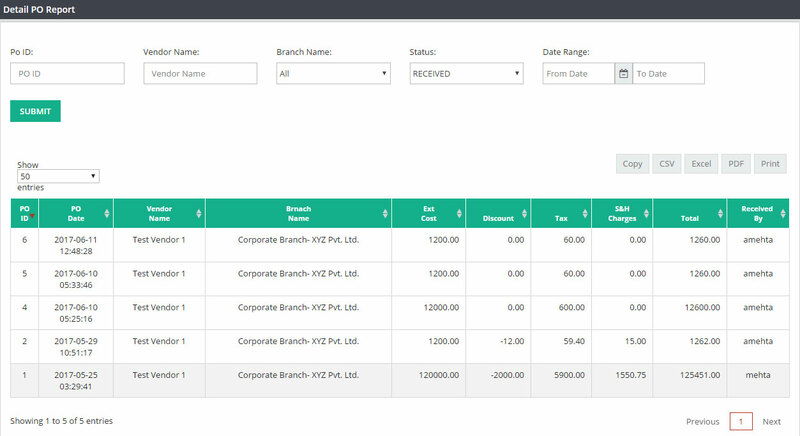 Branch Name : Branch name or company name. Ext Cost : It will display Ext. Cost for line items. Discount : If you have received any discount from your vendor while creating this purchase order, that amount will display on this column. Tax : Tax on PO amount. S&H Charges : Billed S&H Charges on PO. Total : Total PO amount. Received by : User ID of the person who received this PO. If you want to copy or download the data from this screen, please click on Copy/CSV/Excel/PDF options. You can also print the document from here.